Click here for audio of Episode 1305. Today, we set the pitch of a concert A. The University of Houston's College of Engineering presents this series about the machines that make our civilization run, and the people whose ingenuity created them. The story is told of a conductor who had problems with an out-of-tune soprano. Finally he turned to her in frustration and hissed, "Madam, would you please give the concertmaster your A?" Today's A above middle C has been set at 440 cycles per second or 440 Hertz. Before the concert, the concertmaster bids the oboist play an A for the winds. Then he tunes to that A and plays it for the strings. In the end, all ninety players should be agreed on the same 440 A, but the best human ear is hard put to tell a 440 A from, say, a 442 A. The best-tuned orchestra is close to, but never exactly on, the standard A. So how did we create that particular pitch before we had electronic measurements? How did we tune a tuning fork? Agreeing on pitch became a serious problem as orchestra sizes increased during the Baroque era. Baroque musicians often used organ pipes as standards even though pitches varied greatly from one organ to another. In 1619 composer Michael Praetorius proposed a particular A-425 organ pipe as a standard. He pointed out that higher pitches led to broken violin strings. That was almost a half-step below today's A-440. Down through the Industrial Revolution, A generally stayed below that 425 Hertz number. The tuning fork Handel used in the premier of Messiah is still around. It gives A-423. But 19th-century instruments took on the mechanization of steam power and music intensified. People lengthened violin necks. Gut strings gave way to steel. Valves appeared in French horns. Orchestras became larger, louder, and more lush. Pitches also rose. By 1850 A's were crowding 450 Hertz. Much 18th-century music could no longer be performed at those pitches. Musicians grew alarmed. Enter now a physics professor named Jules Antoine Lissajous. Lissajous had written a thesis on the mechanics of tuning forks, and in 1855 he wrote a paper proposing to set A at 435 Hertz. Three years later Napoleon III set up a commission to set a standard, and he appointed Lissajous to be its consultant. 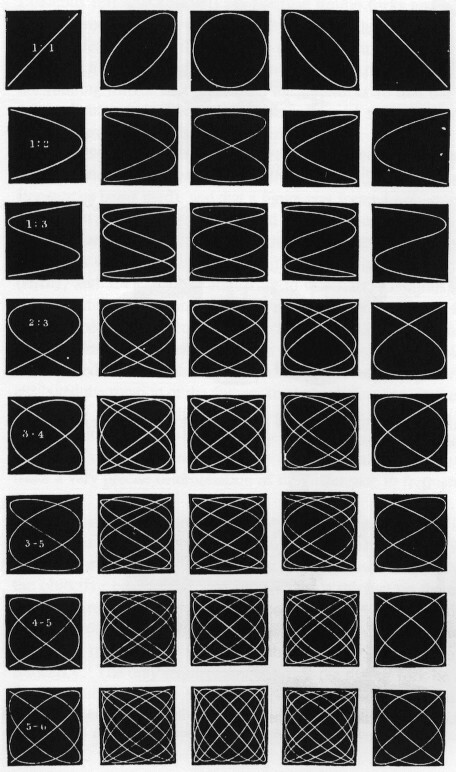 Lissajous had developed clever means for calibrating a new tuning fork against a standard fork. He fixed small mirrors to one tine on each fork. Then he shone a beam of light on one vibrating mirror so it reflected onto the second vibrating mirror and then upon a screen. The result was a steady ellipse if the two forks were in agreement. The figure would swim about if they were not. And so we created standard tuning forks. One rides in my wife's violin case today. But the French couldn't stop the trend of rising pitches just yet. Only in this century has the pitch of an A been held at 440. Today's orchestra players are likely to walk onstage with instruments pretuned to a backstage oscilloscope. An electronic policeman holds the line. Only Baroque ensembles revert back to an older and gentler standard -- to an A of 415 Hertz. Lindley, M., Wachsmann, K., Rhodes, J. J. K., and Thomas, W. R., Pitch. The New Grove Dictionary of Music & Musicians, (Stanley Sadie, ed.) Vol. 14, pp. 779-786. 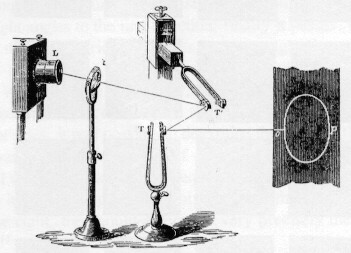 Turner, S., Demonstrating Harmony: Some of the Many Devices Used to Produce Lissajous Curves Before the Oscilloscope. Rittenhouse Journal of the Scientific Instrument Enterprise, Vol. 11, No. 2, 1997, pp. 33-51. Lissajous, Jules Antoine, The Dictionary of Scientific Biography, Vol. 8, New York: Charles Scribner's Sons, 1973, pp. 398-399. Tyndall, J., Sound: A Course of Eight lectures Delivered at The Royal Institution of Great Britain. New York: D. Appleton and Company, 1867, see especially pp. 58-63. I have taken some liberties here in the name of simplicity. Baroque pitches varied all the way down to around A-390. There is also evidence that some Italian Baroque ensembles may have used an A as high as 460. It is common for harpsichords to tune to A-392 today. The range form 410 to 425 seems to have been typical in the 17th and 18th centuries, however. Today, many orchestras are once again pushing pitches up beyond A-440 in an attempt to create a brighter sound. I am grateful to several musician friends for their counsel, notably Matthew Dirst and Katherine Ciesinski of the UH Music School, Bob Stevenson of Radio Station KUHF, and Mark Powell of both organizations.